Tyler has worked for the Parks Department for almost five years. He is 33 years old and athletic competition is still a big part of his life. Tyler participates in two different, perhaps not so well known, sports- Skijor and Ultimate Frisbee. Saying he “participates” is an understatement. In January, 2017, he competed in the International Federation of Sled Dog Sports (IFSS) World Championships, and this year is headed to the Ultimate Frisbee Master’s World Championships. Tyler began playing the team sport of Ultimate Frisbee while in college. Ultimate Frisbee is an exciting, non-contact team sport played by thousands all over the world. It is a fast-paced game, demanding its players to develop razor sharp throwing skills and immense stamina and agility. It is fast, nonstop play. To remain competitive in this game, Tyler keeps a regular workout routine that involves explosive cutting with sprint workouts, weight training and other dynamic exercises. At his age, he says, his workout also includes core strengthening and muscle stabilizing exercises to help prevent injury. Many of the players he faces in competition are in their 20’s and despite that, his most successful seasons have been in the past couple years. In the wintertime, Tyler focuses on Skijoring. Skijoring is a combination of cross country skiing and dog sledding. The dog is outfitted with a dog sledding harness, which is attached by rope or towline to a harness worn by the skier. 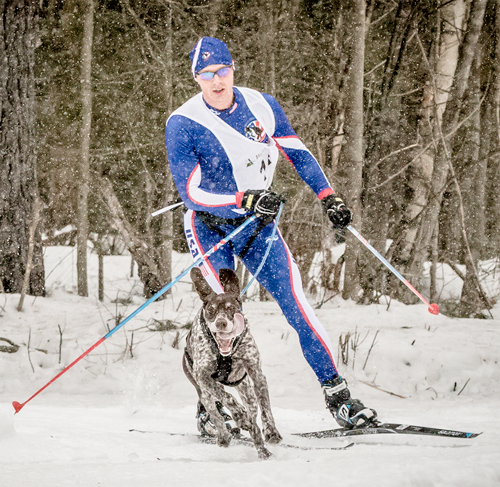 It’s a cooperative sport that employs the athletic ability of both dog and skier. The skier is not just along for the ride. The dog isn’t pulling like a sled, but rather adding marginal speed and getting the skier through terrain that would otherwise slow him/her down. The aerobic benefits of cross country skiing are huge, burning more calories than competitive swimming, biking and tennis. In his late 20’s, Tyler began having knee problems which eventually led to a series of four surgeries. It was two to three years before he was back 100%. He had seen fellow athletes become injured which permanently derailed them on their whole fitness journey. However, Tyler’s love for these sports and commitment to being physically fit kept him from giving up. He enjoys the community these sports provide, the competition and the mental benefit from being out in nature. He has found activities he enjoys which happen to keep him in good shape. And, that could be the trick for all of us in sticking with a regular exercise routine. Do you have questions for our featured employee? Send them to us at HealthyStPaul@ci.stpaul.mn.us and we will publish a Q&A in a future issue.